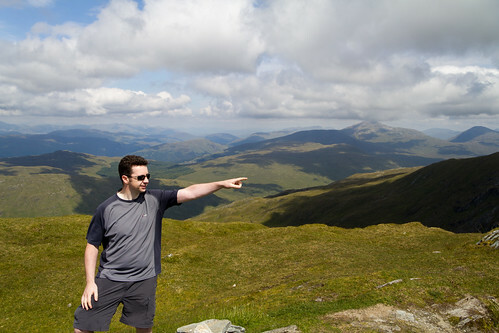 The final, for me anyway, Arrochar Alp was Beinn Bhuidhe and yesterday seemed to be a fine day to tackle this munro. 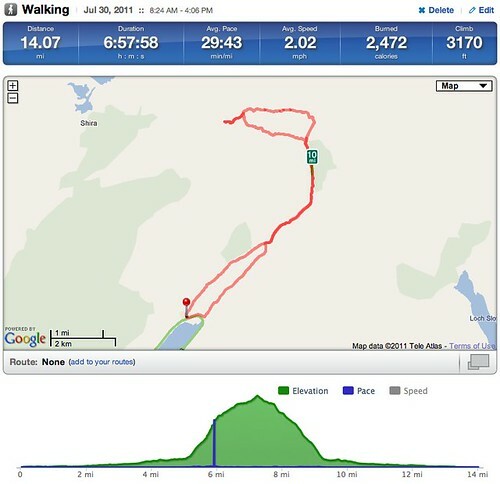 It was rated more difficult and required a four mile walk before beginning the climb but for me this was probably my hardest walk. We started early from the head of Loch Fyne on our 4 mile walk. First mistake of the day was heading through the quarry. Think of the Doctor Who episodes from the 70’s and 80’s which were all set in quarries and you’ll get the idea – not exactly picturesque. We cracked on and it was pertty warm/muggy even though it was only 09:00. After 4 or so miles we were starting to wonder where the path was for Beinn Bhuidhe. 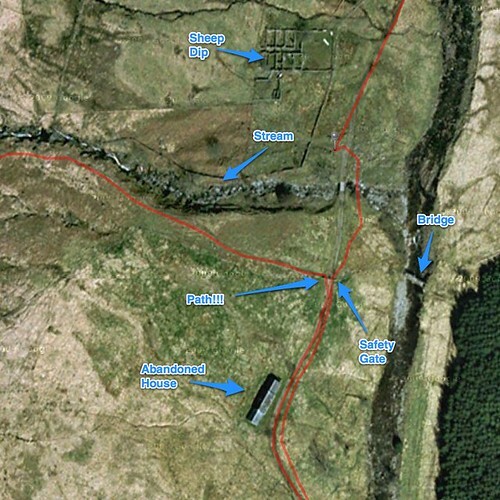 We kept walking until we got to a sheep dip on the map, thinking that maybe this was the route up? After 10 mins of discussion we cracked on until we had walked 5 miles – we were then convinced we had missed the path but never mind – lets crack on up the hill and we’ll find it soon enough. In case you’ve stumbled on this website looking for advice look at the map above. The path is halfway between the abandoned house and the stream, directly on your left after you pass through the safety gate. In winter/spring it might be obvious but at this time of year almost impossible to spot. We bumped into a couple of groups later on who had made the same mistake which made us feel a whole load better…one day we will learn. Anyway, back to cracking on up the hill. We skirted around a small woodland and walked up some steep undergrowth – thick grass and bracken. It was warm and unpleasant and the midges were out in full force. Nice. This was much the same for a lot of the walk. We also got split up and were walking as individuals for much of the first 2/3rds of the walk. Around 600m I had to stop. Was feeling very ropey, sweating buckets and convinced I was going to be sick. Was also thinking Danny had dropped back quite a bit so I may as well wait. 5 minutes later and I was sick. First time on a hill walk that I’ve been that unwell. A few mins later and despite being that far up I was convinced that I should turn back. A couple of mins later I spotted Danny ahead of me – he had taken a slightly different route and was now looking for his lost sunglasses. A quick shout and he buddied up with me for the rest of the walk and I carried on. Big thanks to him – he will now be known as sherpa Dan. The walk up was great after 800m. Some ridge walking and we also found a path! Finally! The views from the top were stunning. 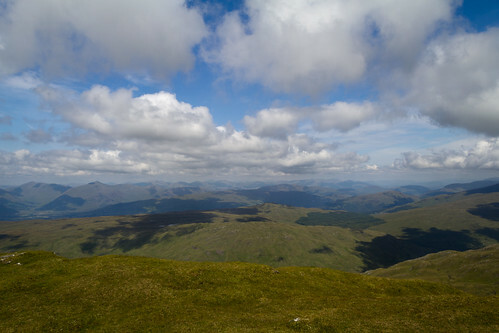 Photo’s really don’t do it justice – it was some of the best views from a munro yet. After a quick lunch (half lunch for me as I still felt ropey) we cracked on down following the path this time. The path from around 500m follows the stream all the way down to the starting point and was steep and pretty awkward in places requiring a wee bit of scrambling and searching for hand holds. In some ways it felt no easier than the route we eventually took although with hindsight it was more straightforward. I’m sure taking the path is also more scenic as there are a few waterfalls to see on the route up. We couldn’t believe how obscure the path was when we reached the start point – no wonder we missed it! We walked back to the car, this time avoiding the quarry which was a far better option. We also indulged on some ice cream at the car park. I’m sure Bounty ice cream isn’t recommended for an upset stomach but it helped me! As usual, full photo set is on Flickr but not as many as usual – didn’t feel up to it really which is a shame as some of the ridge views were great. So a tough walk especially on a warm muggy day but the views are stunning. For me, that was the last Arrochar Alp and was actually the most rewarding after The Cobbler despite the heat, sickness, my burnt neck and arms or the extra midge bites I picked up. Well worth doing but start early and if you’ve got the option, take a bike and cycle the first three miles. Your legs will thank you later.